Image size 69" x 36"
Paper size 73" x 40"
Image size 65.5" x 65"
Paper size 65.5" x 65"
Image size 37" x 29.5"
Paper size 39" x 31.5"
Image size 23.5" x 34.25"
Paper size 26.25" x 36.5"
Image size 63" x 47"
Paper size 63" x 47"
Image size 42" x 65"
Paper size 42" x 65"
Samuel Levi Jones was born and raised in Marion, Indiana. His work explores the relationship between documents and systems of knowledge and power. Jones deconstructs discarded books and other historical materials to build collages that question the selectivity of “authoritative” texts and documentary practices. His large, grid-like compositions examine exclusion and identity and critique larger issues of social and racial inequality that are at the forefront of current debates in the United States. 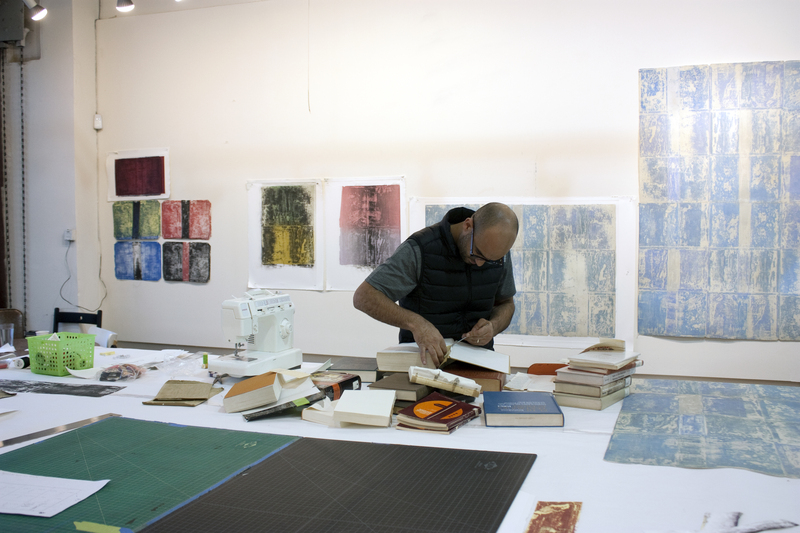 In 2014 Jones received the Joyce Alexander Wein Artist Prize, an annual award whose past recipients include prominent artists such as Leslie Hewitt, Glenn Ligon, and Lorna Simpson. His work is included in collections such as the San Francisco Museum of Modern Art, California; Rubell Family Collection, Florida; Los Angeles County Museum of Art, California; and Studio Museum in Harlem, New York. Jones is represented by Galerie Lelong in New York and Patron Gallery in Chicago. Born 1978 in Marion, Indiana. Lives and works in Chicago, Illinois.